Standard features include: Stabiliser jacks and electric brakes, 16m BTU furnace with electronic ignition, 6 gallon Gas water heater, Oak framed mortice and tenon cabinet doors, 3 Burner range, Mini blinds throughout, Refrigerator, easy store sofa bed (most models), System monitor panel, 45 amp power converter. 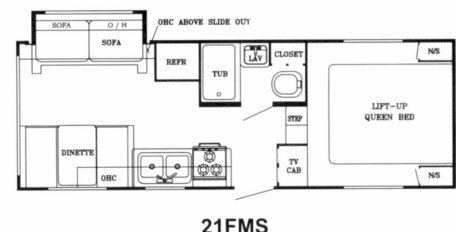 Optional features: Microwave, roll-out awning, CD player/stereo, TV antenna, Outside grill, Interior upgrade. Construction: One piece seamless roof with 12 year warranty, Tubular steel cambered frame, Floor joists 13"on centre, Tapered roof rafters, Fibreglass insulation hand cut and glued.